And I was new to quilting and had the crazy idea that I might make two of them. Because I kind of went to some trouble to find all those different novelty prints, I guess. So I cut out parts for two quilts. But I never made the second one, and I don't want to. I still have everything for that second quilt top though, except the rainbow border fabric. I've thought about giving it away for a while, and today I went to my bin of ancient projects and got it out. If you want this sort-of quilt top kit, please just leave a comment on this post. I'd love it if you want to tell me your name and where you live and something fun you've made lately. I'll pick a winner sometime on Saturday, May 1. My name is Glapha and I live in Idaho. I made a pillow with some embroidery on it. 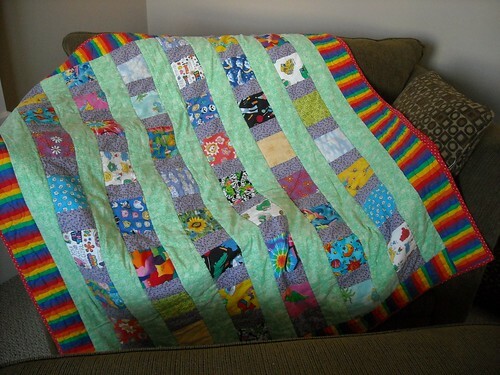 Until my daughter gets a job, I won't have my sewing room, but the quilt looks fun to make when I can. I am currently working on TONS of different things, on thing is the MBS project. Thanks for sharing your wonderful bundle of novelty fabrics. It looks like such a fun quilt. My name is Jocelyn, and I live in Florida. I've made some cards from pictures that I have taken. It's fun to make special cards for special people. I am working on an I-spy for my 2 year old niece and these can certainly add to it! I'm Krista and live in new Mexico. My hubby is active duty military and we move a bunch. I recently finished a quilt that I quilted names into it. It was fun! BTW I'm co-hosting a virtual bee/exchange. Check out my blog if you are interested. I would love if you joined! My name is Leah and I like in England. I'm currrently working on putting together a quilt made with blocks sewn for me by the ladies of a Quilting Bee I'm involved in. Hi. I am Nicole and I live in Minnesota. I recently finished a table runner for my oldest son's new apartment. He and his wife are expected my first grandchild in August, so I would make up this quilt just like you did for my grandbaby. I'm Jenny and I live in Georgia. I am somewhat new to quilting, currently working on my fifth quilt, but the first one I plan to keep. Sunday I made a little wrist band/key chain for my mother in law so she can keep up with her her house key! I love your blog and enjoy keeping up with other crafty people. I get so much inspiration from y'all :) The quilt I'm making now is whirligigs and is so much fun. I have looked at quilts using that pattern and thought I would like to make it someday. I live in eastern PA and started quilting 4 years ago when I retired from teaching. I miss my kids but love that I have time to do things like quilt. Right now I'm working on finishing 2 baby quilts. Have yet to top my personal best of completing 3 quilts from start to finish in 2 weeks. I do best under pressure. My name is Tracy...I live in PA and I just recently finished a quilted purse for my cousin...and I LOVE novelty prints! What a cute quilt. I'm Sara from PA. Lately I've been making mini quilts and having a lot of fun doing it. Rachelle from Shawnee, KS. I am crocheting a blanket for my 6th child, due in Aug and I am "researching" to attain my goal of making my first full sized quilt. thanks for the chance to win. Oooh, Lovely! My name is Kellie and I live in the Chicago suburbs. I am making a quilt for my best friend who had a little girl born the day before my son, so it is quite special. Thanks! i would LOVE this project to do. i am new to quilting but love it so much. the cutting out part is the WORST for me lol. im not very good with getting eact measurements. here is the album on FB that you can see the pics of it.http://www.facebook.com/album.php?aid=34202&id=1039778145&l=1b57e31ecb and some of the other projects. My name is Faye, and i live in New Port RIchey Florida. home of the hot flat marshlands :) please give me the opportunity to give me gusto for another project! I would love to win your partial quilt kit with all those novelty fabrics. Fun! Hi-I'm Amy from PA. I have been getting ready to play host for the online quilt bee I am apart of. It is fun, but so nerve racking too! Hi, My name is Balinda. I have been making lots of pinwheels and flying geese lately. I love making quilts with novelty fabrics. i may take some of yours and mix them up with some of mine and make something new. Hi - I'm Renee from Washington. The last project that I've been working on are some pillowcases for my niece and nephews. Each one is made from cute prints that match their individual tastes. My name is Doina and I live in Romania.I am making a quilt for my son. Thanks for the chance to win! 3 days ago I started a quilt marathon. I have to make at least 6 baby quilt for now babies in the family and group of freinds that are on the way to be born in the following 3 month. I just finish the first top for the now baby girl of my sister-in-law that was born Saturday morning. My name is Dianne and I live in Miramichi, New Brunswick. My last project was a blue tile quilt for my grandson and his sister, in celebration of the birth of their first child, a beautiful little girl. Enter my name in the draw please. My name is Polly and I live in Ohio.I am just starting to quilt and would love to try and make the quilt! Thanks for giving me the chance to win! Hi, I'm Anita from Florida. Right now I'm in the midst of making a paper pieced star quilt...I would love a break to make your quilt! Great giveaway. 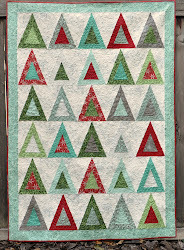 This quilt kit is so cute. I am from the cold part of Florida and I recently made some gift wallets for my daughters bridal shower. They were cute and fun to make. thank you for the chance to win. I'm Deb from Virginia, and of course, I'd love to win your fabrics! I would use them to make a quilt like yours because it looks so fun. Right now I am in the middle of several quilt-alongs but am quite a bit behind. Today I'm working on my pinwheel quilt-along and also the jelly roll quilt-along blocks. I still haven't posted my figgy pudding quilt that I was doing for your quilt-along, Vicki! I will catch up though!! my name is Amber and i live in Idaho. The last thing i made was two baby quilts for my family. Hi my name is Patty. I am a quiltaholic. I live in southwest Iowa, only about an hour from 7 quilts shops. See why I have the addiciton I do? The last thing I made was a baby quilt for my soon to be here, grandson. Before that I had a quilt I had made probably 25 years ago when I first started quilting, and the quilting was coming apart, and the batting was getting lumpy, so I un-quilted it(rip rip rip while I watched TV) and had it requilted and now it's good as new. I didn't want to get rid of it cos it was one of the first quilts I had made. I would love to take these off your hands - I have been collecting novelty prints too for an Eye Spy quilt. I'm Erin and our Army family is currently stationed in Germany. I've got a baby quilt waiting to be finished while I finish some stuff for school (which, as you can see from the time I am spending here, is not happening). What a fun bunch of fabric. I've been working on bags lately - Mom's day is coming up. Thanks for the giveaway! I'm in norhtern Maine. 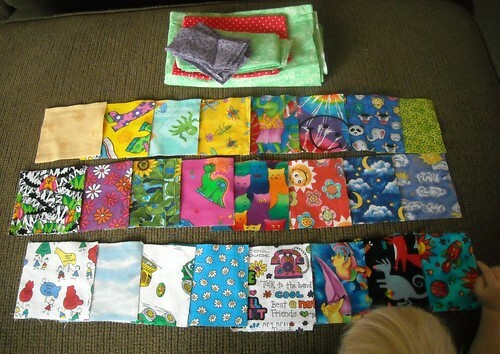 I've collected novelty squares to make quiltlets for the grands, but haven't made them yet. Of course the 8 grands are all under 5 so I have time; and there are two more coming this year! ANyway, my latest quilt for a new grandbaby was a pink/brown dresden plate. I bought the ruler this year to give it a try. I like the looks of dresdens, but my, they are more work. Of course, this new baby it was for has 4 older BROTHERS and she was the first girl, so it had to be extra special! Hi, I am Julie and I live in the Pacific NW in Washington State! Something fun? Well, something kinda funny, to me at least. I have fabric for a flying geese quilt; I figured I could make 535 geese with the amount of fabric. So I got busy and cut and drew diagonal lines and pinned and pinned and pinned. I started to sew. And somewhere along the time, it dawned on me that although I had enough fabric for 535 geese, I only needed 125! I was focusing on the wrong element of quilt designing. Well, now I can have some fun designing something else with all these precut pieces! Hello, my name is Lexi. I have recently made a quilt with a moda honey bun as featured on Moda Bake Shop. I am trying my hand at machine quilting so thought this would be a good project to whip up and quilt in the smaller size. I love reading your blog, you are inspiring! I live in Australia so feel grateful to be able to join the quilting community all around the world. My name is Debi and I live in Texas. I am making charity quilts and would make this quilt to give to the Denton County Vietnam Veterans. This organization also has members who are serving in Iraq and Afghanistan. I forgot to add that the charity quilts I make for this organization are for the families of the servicemen/women. What a great giveaway. Fun things I have made lately - bee beautiful blocks! I am also stash busting and coming up with ways to use my fabric. These would make a cute quilt. My name is Emilee and I live in GA.
looks like fun. I would make it for a baby at my hospital who needed a blanket. Love the virant colors. Would be great in my grandsons quilt. Hope I win !! Fantastic kids prints, this is a true treasure. I'd be thrilled to give this project a new home and bring it to life. I've got a few irons in the fire at present from pincushions to my decorative mice to quilts for my grandson BUT there's always room for one more to-do :o). and I'm on the prairies of Canada! Now how fun would this be to make into a little game quilt for my granddaughter.....with two of each print already cut we could make the quilt together then play the match game...finding the matching novelty prints. That is a cute little head of blonde hair in the second photo, and cute little fingers, too. I'll teach her to play one day! Give her a hug for me! I miss you all.